November--and its meeting--are fast approaching! We will be meeting this coming Saturday, November 1 from 10 am to 12 pm at the West Newbury Town Hall Annex. Please bring your Show and Tell items, and your A Sense of Place swap minis. 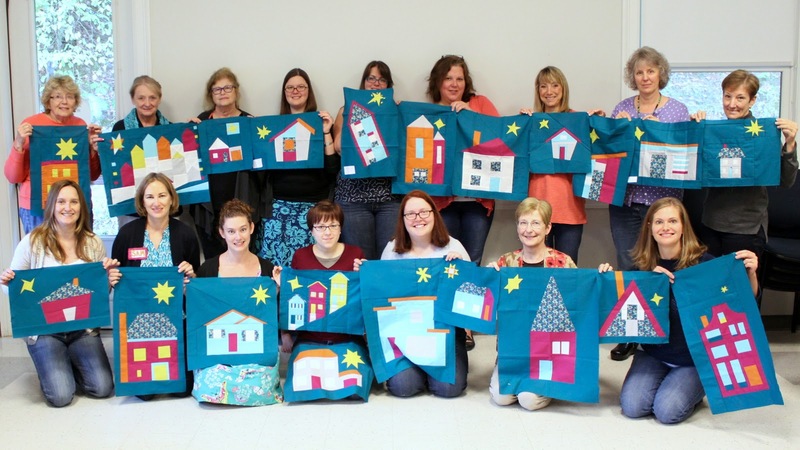 Our activity after the meeting and after show and tell will be a discussion of what makes a quilt modern, in preparation for our 2015 show at The Gathering. If you have a quilt that you think is "modern" that you don't mind having discussed, you are welcome to bring it. We will also be looking for discussion material among show and tell and our swap minis. If you have a quilt that you have already made that you are on the fence about submitting, you are welcome to bring it for discussion. Finally, we would like to have all 2015 dues paid by the December meeting. The 2015 dues will remain $50. Laura will be accepting dues at the November and December meetings. Our Annual Business Meeting will be held at our regular meeting on November 1, 2014 at the West Newbury Town Hall Annex. At this meeting we will be electing our officers for the 2015 calendar year. Our October meeting was held on October 4 at the Fremont Public Library in Fremont, NH. QuiltCon Charity Quilt Challenge blocks were collected at this meeting. The blocks were SO beautiful and varied! Look for photos of makers and their blocks in Karin's upcoming blog post about the project. By the November meeting, Jessica et al will have assembled the quilt and Mary will have quilted it. They will then pass the quilt to Nancy and Sue who will bind it and attach the sleeve by the December meeting. Northampton swap minis are due at the November meeting. If you volunteered to participate in this swap, get stitching! The theme is "a sense of place" and the quilts should be 20'' x 20'' or smaller. There are no other fabric or color restrictions so enjoy being creative! Speaker arrangements are being made by Amy. So far, we have Lee Heinrich visiting us in March and Sherri Lynn Wood in May, and we may be able to work out additional speakers for the fall. Stay tuned for announcements about these events. The 2015 retreat will be the weekend of April 24-26 in Kennebunk, ME. Laura is getting pricing from the retreat center and will pass on information about costs and deposits as it comes. The Gathering 2015 Exhibit subcommittee has met and distributed information via email. Mary distributed a handout at the meeting. The SMQG Banner subcommittee has been formed and has been spearheaded by Jessica. If you would like to join this subcommittee, please contact Jessica ASAP. Officer nominations were made. The following people have been nominated for the following offices: President: Laura; Vice President: Judy and Mary; Treasurer: Jessica; Secretary: Peg. Please make every effort to attend our business meeting in November and vote to elect our officers! The December end-of-year celebration is quickly approaching. At this meeting we will have a potluck to celebrate two great years of being a guild, and we will have a handmade item Yankee swap. To participate in this year's swap, you must bring a small, handmade item such as a pincushion, mini quilt wall hanging, small bag, etc. Samantha did some really sweet orange peel quilting on her Michael Miller challenge piece. She'll be giving it away as a baby gift. The citrusy colors make it very baby-appropriate! Jessica took a seam ripper to her unloved top from last month's show and tell. She took apart the HSTs and reassembled them, and this piece has much more symmetry and rhythm. I think our group admired her willingness to rip and resew something that wasn't working, rather than wadding it up and hiding it! Jessica's also doing a fine bit of multitasking with this mini quilt. It was her handquilting piece, and also will be her Northampton swap mini. See how her skirt matches the sky?! 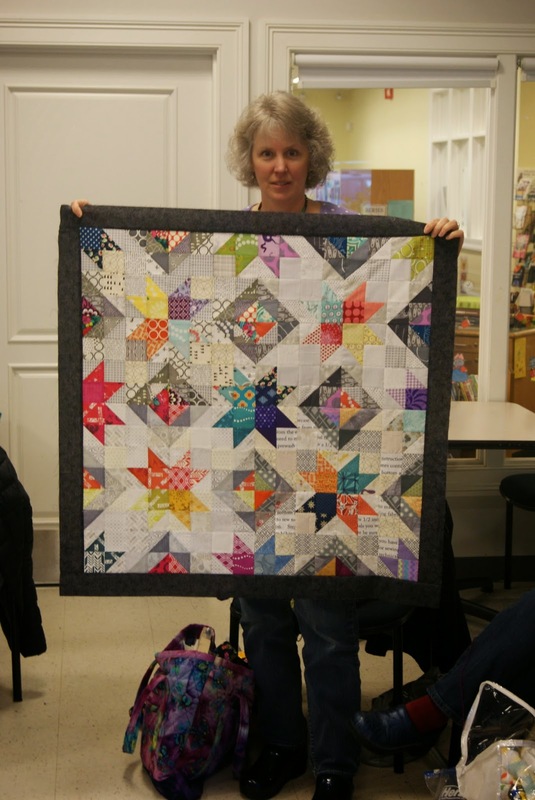 Karin showed off her handquilting piece: a Dresden plate made from Leah Duncan fabrics. Karin also made this cute horse applique wall hanging for her daughter's room (It is also a Sizzix tutorial!). She says be careful not to be too still next to her or you might get appliqued to something! Karin remade a blue version of her herringbone table runner out of Spotlight store fabrics because her pattern is being used as a tearsheet in the stores! And Karin's Halloween tumbler quilt (I didn't catch her much more clever name for it!) is made of Riley Blake fabrics. Her quilter did a fabulous spiderweb design for the quilting. The green binding Karin chose is unexpected and perfect! Barb also used this circle of geese block to teach herself to paper piece. What beautiful colors! Diane made these three quilts out of some appliqued butterfly blocks from a lady in her family. The butterflies are genuine vintage fabrics--they look like feedsacks to me. She set the butterflies very creatively, and the quilts will be for children in the family. I think she said she has even more of these butterflies! 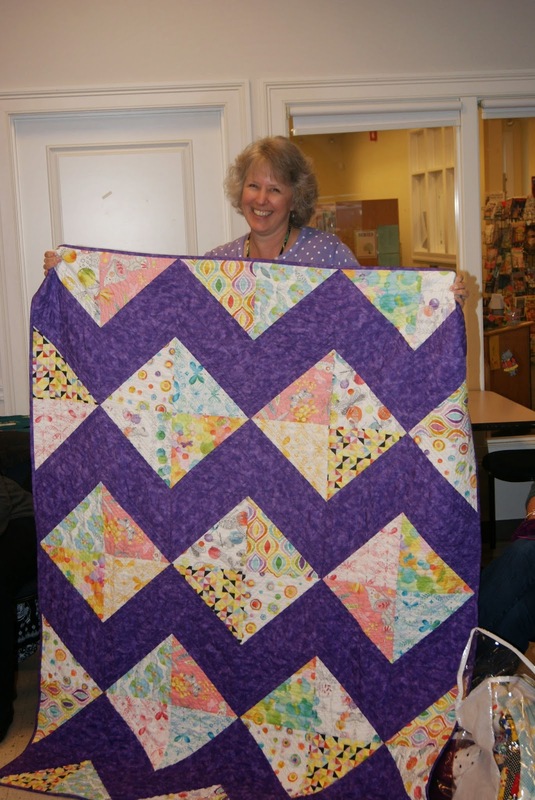 Nancy finished her purple and green wedding gift quilt! and she made this wall hanging size quilt out of some of the blocks from last month's block lottery. These blocks look so beautiful assembled! Colleen made this colorful quilt out of Amy Butler fabrics. I believe she said it was a bed quilt for her daughter? Colleen also made this gloriously scrappy wonder. She laid it on the floor and we all spent several minutes peeking out our favorite fabrics! What fun this one will be to use. Peg's piece for handquilting is a gift for a writer friend. The typewriters are very appropriate! Laura is maybe done making fox quilts now, but also maybe not. The foxes also made a cute mini quilt! 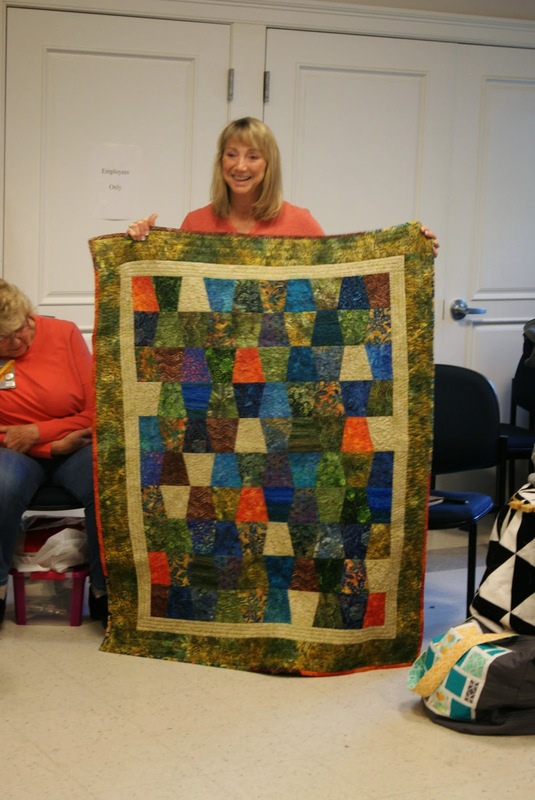 Paula gave a great lesson on handquilting at this meeting. It was such a fun stitching-circle experience, all the ladies sitting around and working on their quilting handwork. I learned several new tips I didn't know, and I am *determined* to get that rocking motion down correctly. It was such a treat for me to get to watch Paula use her thimble to rock the needle back and forth--I taught myself to handquilt by reading the internet, and you really miss out by not watching someone experienced work! Thank you Paula! Our next meeting will be Saturday, November 1 in West Newbury; the agenda includes the annual business meeting and elections. Hope to see everyone there. ETA: Here is Karin's group photo of all of us with our house blocks. Thank you for sharing this photo, Karin!